For all those people who are interested in the Eurovision Song Contest, here are the details for 2003. The 2003 Eurovision Song Contest was held at the Skonto Olympic Hall in Riga in Latvia on Saturday 24 May 2003. Presented by Marija Naumova and Renars Kaupers. Full results appeared here at 01:50 UK on Sunday 25th May 2003. Later than normal due to the Eurovision Party in Birmingham I went to. Please click here for full 2003 details! (Pre Eurovision Night). This detail pages was this page until 24 May 2003. There are loads of info about this years contest. The important news about 2004 contest is at the bottom of this page. UK qualify automatically to the final due to be one of the big 4 country even they got nil points. 1 . Turkey (4) 167 Everyway That I Can Sertab Erener 4 English!!!! The winner was Turkey, the first for Turkey. The United Kingdom has their first nil points ever. For Background Details to the 2003 Eurovision Song Contest, please click here. For 2003 song lyrics, please click here. The first Junior Eurovision Song Contest took place in Copenhagen, Denmark. Click here for full details of the 2003 Contest. These are early predictions of which some have changed. Automatic qualification will go to the following countries. 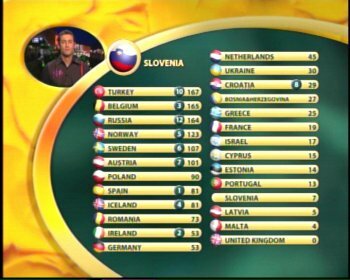 The winner of the previous year, the next 9 highest score, the top 10 of the qualifying rounds and also the big 4 countries (pay a lot of money to the EBU), including United Kingdom, France, Germany, Spain. This means that even that the UK got nil points for 2003, they qualify automatically to the final. The contest will be over 2 days.